Russian Wheat Aphid has been found on wheat crops in the northern Mallee. 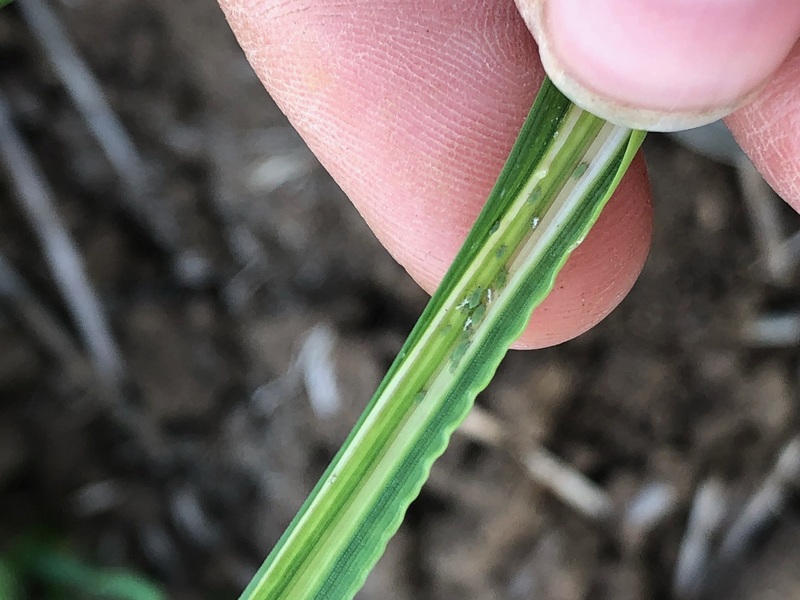 THERE have been recent reports of Russian wheat aphid (RWA) activity in wheat crops in Victoria’s northern Mallee, particularly around Tooleybuc and Manangatang. Predominately detected in crops not treated with Gaucho at sowing, growers should prioritise inspecting these paddocks and look for aphids at the base of curled or rolling leaves with white/pink streaks running the length of the leaf. Birchip Cropping Group (BCG) researcher Claire Browne said it was important to look for aphids on symptomatic tillers and not just the symptoms alone. “Guideline thresholds are 20 per cent of seedlings infested up to the start of tillering or 10 per cent of plants infested thereafter,” she said. Where possible use ‘soft’ options to keep beneficial populations high. Lorsban can be applied at lower rates (300-400mL/ha) as this will be softer on beneficials. Use a minimum water rate of 100L/ha and medium droplets, such as flat fan nozzles. RWA infestations aren’t believed to be widespread due to a lack of a green bridge over summer resulting in low aphid pressure so far however cereal crops still need to be constantly monitored as the season progresses. RWA are not an effective virus vector, however they inject a toxin into the plants which causes the retardation of plant growth and can eventually kill the plant if there is heavy infestation of aphids. A trial at Loxton in 2017 showed RWA numbers continued to build up on moisture stressed crops, however 2017 did start with higher RWA numbers than 2018. Research is being conducted by South Australian Research and Development Institution (SARDI) in collaboration with BCG (and other collaborators) on a project titled ‘Regional risks and thresholds for RWA’. A series of treated and untreated plots across trials in South Australia and Victoria will work towards understanding the risks of localised areas. BCG is monitoring a research trial at its main research site at Narraport. Results thus far show 2.14 tillers/m2 or 0.13pc of tillers showing symptoms in the non-infested plots. In the plots that were infested with RWA, the data is showing 9.74pc of tillers with symptoms. No winged RWA have been observed yet. Preliminary results from Keith in South Australia are showing 0.06pc tillers with symptoms in the non-infested plots and 23.17pc of tillers with symptoms in the artificially infested plots. Monitoring of these plots is continuing fortnightly. Further information about the RWA trial will be provided at the BCG Main Field Day on 12 September at Narraport, 18km north west of Birchip. Alternatively, phone BCG on 03 5492 2787.